Written by a preeminent Iranian writer who helped lay the popular groundwork for the Iranian Revolution, The Israeli Republic should be required reading for anyone interested in the history and current political landscape of the Middle East. Documenting Jalal Al-e Ahmad’s two-week-long trip to Israel in February of 1963, his account “Journey to the Land of Israel” caused a firestorm when it was published in Iran, upsetting the very revolutionary clerics whose anti-Western sentiments Al-e Ahmad himself had fueled. Yet, in the thriving Jewish State, Jalal Al-e Ahmad saw a model for a possible future Iran. 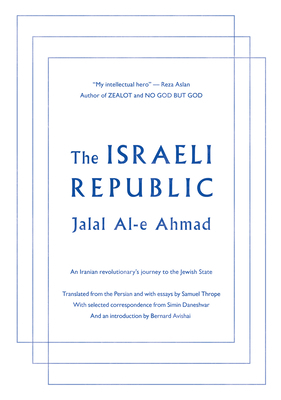 Based on his controversial travelogue, supplemented with letters between the author and his wife, Simin Daneshvar (the first major Iranian woman novelist), and translated into English for the first time, The Israeli Republic is a record of Al-e Ahmad’s idealism, insight, and ultimate disillusionment toward Israel. Vibrantly modern in its sensibility and fearlessly polemical, this book will change the way you think about the Middle East. Jalal Al-e Ahmad was born to a clerical religious family in Tehran in 1923. A teacher all his life, he joined the Communist Tudeh Party in 1943 and quickly rose through its ranks, becoming a member of the party committee for Tehran, before breaking with the Tudeh in 1947 in protest over Soviet influence. Al-e Ahmad was an influential and prolific writer and social critic, whose body of work includes short stories, notably the collection An Exchange of Visits; novels including By the Pen, The School Principal, and A Stone on a Grave; travelogues including A Straw in Mecca, A Journey to Russia, and A Journey to America; anthropological studies; essays; reviews; and translations. His best known work is Gharbzadegi (Occidentosis), which has also been translated to English as “Weststruckness” and “Westoxification,” a cultural critique of Westernization in Iran. In 2013, Restless Books published his polemical work based on his journey to Israel as The Israeli Republic. Al-e Ahmad was married to the novelist and translator Simin Daneshvar; the couple had no children. He died in 1969. Simin Daneshvar (born April 28, 1921, Shiraz, Iran—died March 8, 2012, Tehran, Iran), was an Iranian author who wrote the enduringly popular Savushun (1969; published in English as Savushun: A Novel About Modern Iran, 1990, and as A Persian Requiem, 1991), the first modern Persian-language novel written by a woman. In 1948, while Daneshvar was studying Persian literature at the University of Tehran (Ph.D., 1949), she published a short-story collection, Atesh-e khamush (The Quenched Fire), the first such book by a woman to come out in Iran. She published a second collection, Shahri chun behesht (1961; A City as Paradise) before embarking on Savushun. Later novels include Jazireh-ye Sargardani (1992; The Island of Perplexity) and Sareban-e sargardan (2002; Wandering Caravan Master). She was also known for her translations into Persian of such writers as Anton Chekhov and Nathaniel Hawthorne. Daneshvar was married (1950–69) to noted writer and intellectual Jalal Al-e Ahmad and taught art history at the University of Tehran from the late 1950s until her retirement in 1979. Samuel Thrope is a writer and translator based in Jerusalem. Born and raised in Arlington, Massachusetts, he earned his PhD at the University of California, Berkeley. He is currently a fellow at the Martin Buber Society at the Hebrew University of Jerusalem. Bernard Avishai lives in Jerusalem and New Hampshire. He is a visiting professor of government at Dartmouth and an adjunct professor of business at Hebrew University. His most recent book is Promiscuous: "Portnoy’s Complaint" and Our Doomed Pursuit of Happiness. He is also the author of The Tragedy of Zionism and The Hebrew Republic. "The travelogue conjures up a long-lost era of calmness and curiosity between Iranians and Israelis, as well as the naive yet potent Third World ideology so common in developing countries at the time. But it is important for what it says, not just for what it represents. It suggests how the Iranian and Israeli leaders who feel such intense mutual hostility today actually mirror one another in certain ways, particularly in their foundational attitudes toward religious authority, political and economic populism and the West. That a writer such as Al-e Ahmad, guru to the ayatollahs, liked Israel now seems touching. What he liked about Israel seems cautionary." “A rare and fascinating read." "Before the Islamic revolution, the two countries traded, quietly cooperated on defense projects and enjoyed some cultural ties. Few remember today that a celebrated Iranian author, who some consider to be Iran’s Ernest Hemingway, traveled to Israel and wrote a book about his visit."